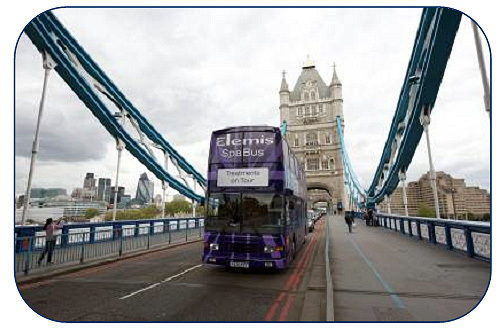 Follow the Elemis Spa Bus on Twitter and Facebook to keep up to date with it’s whereabouts during Elemis’ 20th Anniversary nationwide tour. Always fancied an Elemis treatment? Well for a budget-friendly £10 you can enjoy one of 5 unique and luxurious 15 minute facial or body spa therapies performed by a professional “Elemis Angel”. Instant relaxation and rejuvenation is promised with a maximum results in minimum time ethos. Ensuring that it’s not only you who benefits from a bit of TLC, Elemis will be donating £1 from each treatment and skincare kit sold to charity Mothers4Children and they hope to raise well over £50,000 for the charity during the campaign. 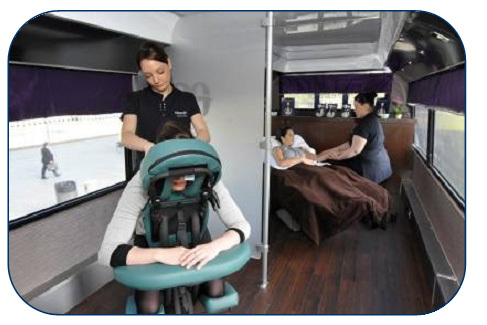 I’m keeping my eye on the @elemisspabus updates and am trying to decide between a Skin Booster Facial, Chill-Out Shoulder and Scalp Massage, Sole Rescue Foot Treatment or Re-Charge Power Back Massage. I think it’d have to be the facial. What d’ya reckon ladies? Bargain! I love Elemis. Their frangipani facial oil is fabulous. I’d have a facial. And they aren’t animal-tested, are they???? ?